In the 1950s, Joy Fat Construction was a leading property developer and allegedly was the pioneer in developing high-rise industrial buildings with elevators that are sold/leased to multiple factories. Prior to that, most factories had to build their own buildings (usually one to two story tall) hence this innovation significantly reduced the cost of entry for manufacturing and enabled HK industries to blossom in the 1960s and 1970s. A native of Tat Ho village in Chaoyang prefecture (潮陽縣達濠鄉), Joy Fat’s founder Chan Ying-for (陳應科, 1907-1962) was born into a poor family and followed his father to Southeast Asia at an early age. He eventually ended up in Hong Kong where he set up the trading firm Joy Fat Hong (再發行) in the 1940s at 140 Wing Lok Street in Sheung Wan. He was involved with the Chiu Chow Chamber of Commerce from its early years and supported its efforts in building schools and clinics for fellow Chiuchow natives in HK. During the Sino-Japanese War in the late 1930s, he donated medical supplies to Chiuchow which was under attack by the Japanese and over the years, he contributed funds to purchase over 30 fishing vessels which were leased to the villagers from his native Tat Ho village and in return the lease payments funded the renovation and maintenance of his family ancestral hall. After the War, Joy Fat Hong was involved in import/export of valuable food products such as ginseng and shark fin and over time built up a large business shipping Japanese red ginseng to markets such as Taiwan and Southeast Asia. It was also involved in the lucrative post-War gold trade and was a member of the Chinese Gold & Silver Exchange Society during its hey days when it had 197 members, 20% of whom were of Chiuchow descent like Chan. In the 1950s, Chan Ying-for sensed tremendous opportunities in the HK real estate market and established Joy Fat Construction (although as a firm it was not incorporated until 1960) and Cheong Loong Investment Co Ltd (昌隆置業, incorporated in 1957 and dissolved in 1972) to capitalize on them. Aside from its Wing Lok Street premise (which was developed into Hang Fat Building), Chan Ying-for began buying up properties in HK and Kowloon, including Lot 129 on Clearwater Bay Road, which he sold to American couple Arthur Thomas and Edna Jean Evans in December 1955 who built their residence “Evansville” on the lot. The house was bought by Dr. Raymond Mok Wah-chan (莫華燦) in 1958 who renamed it “Gladray”. In 1955, the new Building Ordinance relaxed the height control for buildings in HK and as a result, many residential buildings with over 10 floors were built by developers who were eager to meet the housing demand. 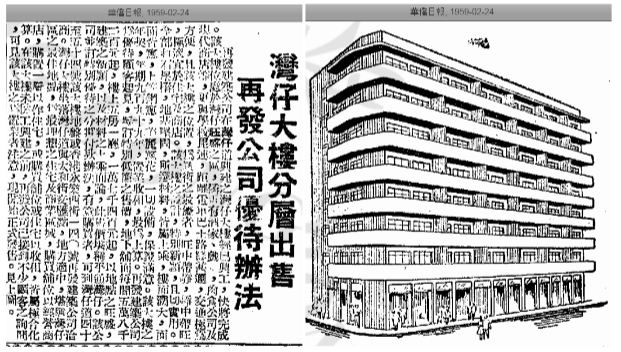 In 1958, Joy Fat built the 12-story Joy Fat Mansion (再發大廈) at 522-530 Queen’s Road West in Shek Tong Tsui with each flat selling at HK$15000 apiece. A 1963 article revealed the challenges associated with taller buildings like Joy Fat Mansion at the time. That year, water supply was heavily rationed and tenants living above the first four floors at Joy Fat Mansion did not have direct access to water. To the credit of the building’s management, a water sharing plan between different floors (which had 138 tenants and 3000 residents at the time) was developed and implemented successfully. In 1958, Joy Fat also developed a 6-story tenement house building (tong lao) at 120 Tam Kung Road in Kowloon at $20000 a flat (total of 12 units, 2 units per floor) – this building was rehabilitated by the Urban Renewal Authority in 2017. In early 1959, Joy Fat developed the 8-story Wanchai House (灣仔大樓) at 40-54 Wanchai Road in Wanchai. The modern style “corner house” building was designed by Chinese architect Ip Hin-fong (葉衍芳). The residential flats (5 rooms and 1 living room each) were sold for $17400 each and shops on the ground floor were sold for $58200 each. Like the Tam Kung Road project mentioned above, this building was rehabilitated by the Urban Renewal Society in 2014. In late 1959, Joy Fat built Joy Fat Factory Building (再發工廠大廈) at 483 Castle Peak Road in Cheung Sha Wan, one of the most modern industrial building at the time. Equipped with Swiss-made industrial elevators, the building had spaces available for 4000 sq ft and 8000 sq ft. One of its prominent tenants is Bethlehem Knitting, the maker of Hing’s underwear covered earlier in another article, which moved in in 1961. Another tenant was Lotus Creations, the high-end fashion manufacturer started in the 1960s by the Chuang family of the watch distributor Lap Heng (to be covered). The success of Joy Fat Factory Building was followed by Cheong Fat Factory Building (昌發工廠大廈) at 265 Un Chau Street in Sham Shui Po (units from 3000 sq ft to 25000 sq ft were available for sale starting at $40000 a unit) and Bedford Factory Building (必發工廠大廈) at 7-19 Bedford Road in Tai Kok Tsui. Sadly, Chan Ying-for died at the age of 55 on May 21, 1962 at the HK Sanatorium and his funeral at the Kowloon Funeral Home was attended by over 1000 friends and family. He was survived by 5 sons and 2 daughters. He was succeeded in business by his eldest son Chan Wing-ming (陳永銘) and eldest son in law Lam Ping-chon (林炳松) who were both directors of Joy Fat and Cheong Loong. Second son Chan Wing-kin (陳永堅) was a medical graduate from HKU and doctor who had worked at Kowloon Hospital, third son Chan Wing-kwai (陳永葵) studied architecture at Cornell University in the US, fourth son Chan Wing-chau (陳永疇) studied medicine at McGill University in Canada while fifth son Chan Wing-lok (陳永樂) was an accomplished pianist while attending DBS. 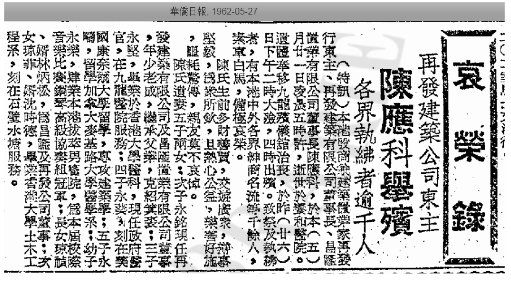 The second son in law Shum Sze-tak (沈時德) graduated from HKU with a civil engineering degree and worked on the Shek Pik Reservoir. Like his father, Chan Wing-ming was a director of the Chiu Chow Chamber of Commerce and continued to contribute to various Chiuchow related causes. In the 1990s, Joy Fat Hong established a joint venture in South China to process shark fin. In 2007, over 600 family and friends of Chan Ying-for from across the globe descended upon his native village of Tat Ho to celebrate the 100th anniversary of the real estate pioneer’s birth.